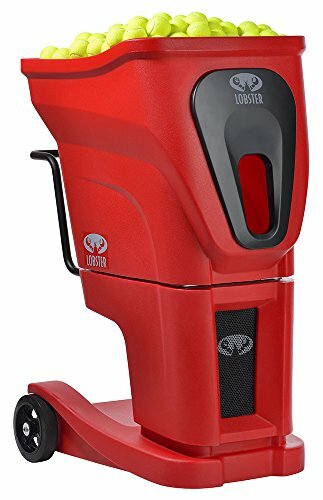 AC-POWERED TENNIS BALL MACHINE: The Lobster Sports phenom two is an electrically powered (AC) tennis ball machine. Weighing 99 pounds, it is designed for durability, longevity, and reliability. REVOLUTIONARY TECHNOLOGY: Advanced technology never seen in this industry has been infused into the phenom two. The full programmability of this professional tennis ball machine allows you to customize your own drills and training program. FULLY RANDOM OSCILLATION: With ball speeds ranging from 35 to 80 mph, a feed rate of 2 to 9 seconds, and topspin and backspin capability, the fully random oscillation features enhance all players' tennis abilities. 12 CUSTOM PROGRAMMABLE DRILLS: This series features 12 custom drills that allow you to select 18 different ball locations, while independently assigning a specific speed, spin, and feed rate for each ball with the custom court drill created. MULTIPLE ACCESSORIES AVAILABLE: You can purchase many accessories separately on Amazon to enhance the phenom two, including the grand 20-function remote, grand remote for Apple, or grand remote for Android.